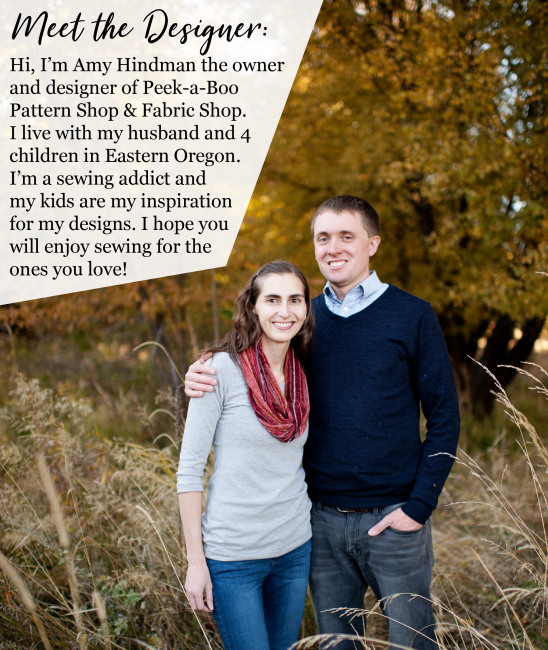 Gathering Knits - Peek-a-Boo Pages - Patterns, Fabric & More! Gathering knits can be a bit tricky, but today I’m going to share with you a few tips to successfully gather evenly and avoid stretching out the bodice when gathering knits. 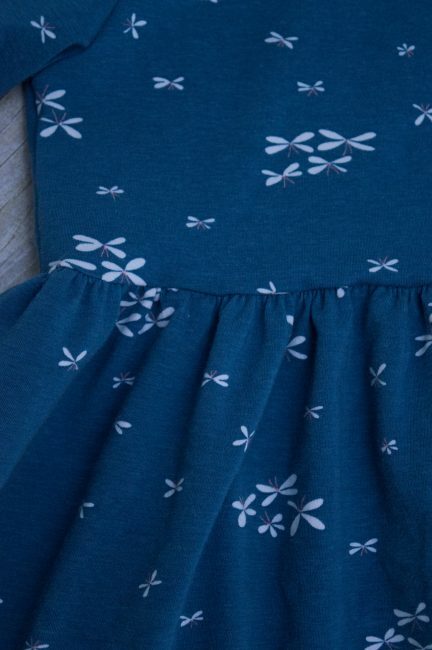 I’m using the Gloria dress pattern in size 18 months. I’ve assembled the bodice and skirt separately and am ready to gather the knit skirt to match the bodice. First take your skirt and bodice and mark them both into quarters. Use the side seams as two of the marks, and then find the middle of the front and back. I used a Frixion pen to mark the midpoints of each. When I sew bigger sizes, I tend to divide my bodice and skirt into eigthths. That way, it’s easier to divide the gathers evenly. After finding the midpoints, set your sewing machine to a basting length. Then turn the tension all the way up. I’ve found the most even gathers come from sewing two or three rows of basting stitches. I usually do two rows. 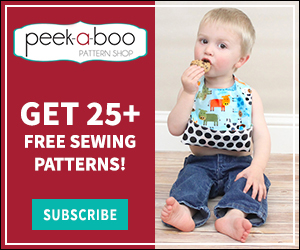 Sew the first at 1/4″ seam allowance and the other at 1/2″ or 5/8″ depending on the seam allowance called for in the pattern. I sew one row inside the seam allowance used to attach the skirt and one row outside of it. 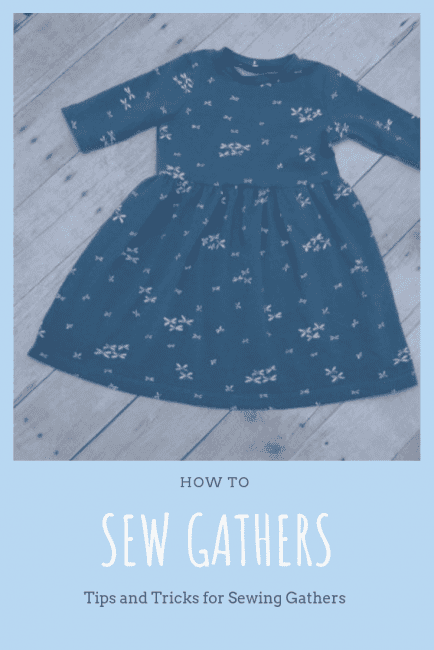 Pull on your bobbin threads to make gathers. I like to overgather to start with. I started sewing on the side seam on this skirt. This helps push most of the gathers towards the far side seam. Turn your skirt inside out and place your bodice right side out inside of it. Firs,t match up one side seam and work your way around matching each of the quarter marks. After matching each quarter mark with the skirt gathered to match the bodice width, spread your gathers evenly. Then pin/clip your bodice to your skirt all the way around. As you can see, I use a lot of clips. I have found it’s better to overpin/clip to keep the gathers even. Then (after turning the tension back to normal on your sewing machine), baste the skirt and bodice together with a long stitch length. I will be serging it on in the end, but I find that my gathers stay much more even and I avoid tucks if I baste the skirt on first. 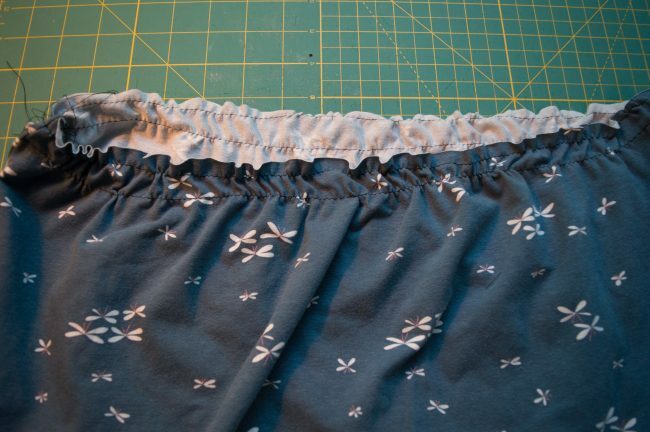 After the skirt is basted on, use either your serger or a stretch stitch on your machine to attach the skirt. I find that using a walking foot and a lower pressure foot tension helps me make sure I am not stretching the bodice. This can cause ripples. Also keeping the bodice on the bottom helps it feed more evenly. Then remove your basting stitches that are visible. After that, you can remove the ones in the seam allowance if you wish as well. Press your skirt and bodice seam towards the bodice. After that, finish assembling your garment according to the directions in the pattern. I hope this helps you gather and attach knit skirts more easily.